The G20 includes the developing nations, including China, Brazil, India and Russia. Together these countries represent two-thirds of the world's people, and 85 percent of the its economy. The success of this G20 meeting means these countries are being recognized for their role as powerful drivers of the world economy. 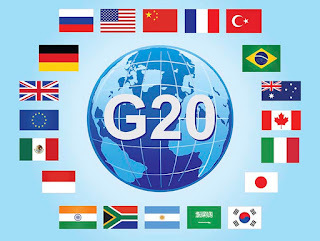 The finance ministers and central bank governors of the G20 countries meet twice a year, usually in coordination with meetings of the International Monetary Fund, the World Bank, and the G-20 summits themselves. The G20 was formed in 1999 to give developing countries a more powerful voice in forming the global economy. The meetings started as an informal get-together of finance ministers and central bankers. During the 2008 financial crisis, the first ever G20 summit was held on November 16-17 in Washington, DC. Before this meeting, most global economic plans were decided by the G-8, which are just the developed countries.Emerging market leaders asked the U.S. to regulate its financial markets more. The U.S. refused. The leaders wanted to regulate hedge funds and debt-rating companies such as Standard & Poor's. They also sought to strengthen standards for accounting and derivatives. Insufficient regulations and standards were blamed for the crisis that turned into a global recession. September 4-5: Hangzhou, China: Both the United States and China agreed to ratify the Paris climate change agreement. They are the two biggest emitters of greenhouse gases. Natural disasters are a bigger threat than terrorism, warned financial guru Warren Buffett. Most scientists agree that climate change is creating more hurricanes, tornados, and flooding. June 26-27, 2010, Toronto: Leaders agreed to cut their budget deficits in half by 2013, and eliminate deficits altogether three years later. For more, see G20 Summit Focuses on Debt Reduction. September 24-25, 2009, Pittsburgh: Leaders established a new Financial Stability Board to establish common financial regulations for all G20 countries. The Board will work with the World Bank and the IMF who have been subcontracted to implement many of these policies.They agreed to increase banks' capital requirements, and tie executive pay to long-term, not short-term, performance. They also wanted to move all derivatives contracts onto electronic exchanges so they can be better monitored. Finally, they suggested that companies that are "too big to fail," like AIG, develop international contingency plans so their collapse wouldn't threaten the entire global economy. The eight leading industrialized nations - U.S., Japan, Germany, UK, France, Italy, Canada and Russia. This group of countries also meets on their own, and are known as the G-8. Eleven emerging market and smaller industrialized countries: Argentina, Australia, Brazil, China, India, Indonesia, Mexico, Saudi Arabia, South Africa, South Korea, Turkey, plus the EU. Why Is the G20 Important? The growth of Brazil, Russia, India and China (the BRIC countries) has driven the growth of the global economy. The G-8 countries grow slower. Therefore, the BRIC countries are critical for ensuring continued global economic prosperity. In the past, the leaders of the G-8 could meet and decide on global economic issues without much interference from the BRIC countries. However, these countries have become more important in providing the needs of the G-8 countries: Russia provides most of the natural gas to Europe, China provides much of the manufacturing for the U.S., and India provides high tech services. Poverty - The Ontario Coalition Against Poverty (OCAP) leader, John Clarke, said “The whole process of putting together this grouping has been about impoverishing people, and benefiting the richest members of society.” In 2010, protesters were against the G20's focus on fiscal responsibility and austerity at the cost of social programs. They also were opposed to the $1 billion cost of the meeting itself, which was borne by Canadian taxpayers. Climate Change - Protesters wanted the G20 to refocus on global warming as a priority. Gender Equality - G20 countries need to pay more attention to rights for homosexuals and provide funding for family planning, including abortions. Immigration - Protesters sought more open borders for immigrants fleeing "humanitarian and climate crisis.